Cliff says he left Belize at 14 years of age, after spending a year at the Ecumenical High School in Dangriga. He attended the Manual Arts High School in Los Angeles, then joined the U.S. Military in 1984, from which he retired in 2005. He then took up employment as a civilian worker at the Naval Weapons Station in Falbrook, CA., from 2006 to the present. 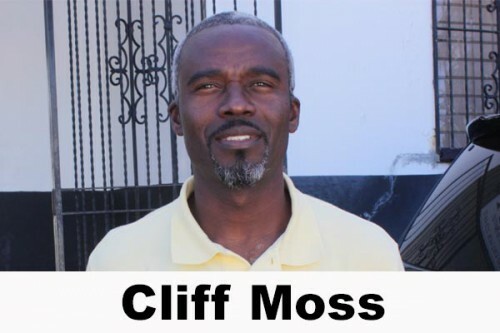 Cliff is the son of Mr. Alvin Moss and Mrs. Ethlin Moss nee Sabio, both of Dangriga, and has three brothers and four sisters. As is typical of many Belizean families, one brother still resides in Dangriga, one is in L.A., and the other is presently in Japan; all four sisters reside in L.A.
Cliff is married to his wife of twenty-five years, Germaine Moss nee Flores, whom he met in L.A. She is also originally from Dangriga. (Her brother is the present owner of the P.G. Sports Bar in Toledo.) They have 2 children, a 22-year-old daughter, Courtney, and an 18-year-old son, Cliff, Jr. According to Cliff, he has been visiting home every year since 1998, mostly during the time of the 19th celebrations; he completed a home in Dangriga in 2004, and plans to return to stay in 6 years’ time, when his son will have completed college. During his time in the military, in which he served in the medical field, Cliff says he made the All Navy football team; and when he later transferred to the Armed Forces, he was also selected to the All Armed Forces football team. DYFA was officially registered in 2012 in the U.S. as a non-profit organization (code 501-C3), and is also a member of the Football Federation of Belize (FFB). There are also plans for the organization to be registered as an NGO in Belize. The U.S. based board members include, President – Morris Herrera, Technical Director – Cliff Moss, Business Manager – John “Biggie” Stanley, and Fund Raising Director – Marina Haylock; and the Belize branch members are, President – Ethan Velasquez, Manager – Bert Bernard, and Coach – Cecil Caliz (who is a former member of the Wagiya football club). The Academy presently has 3 football teams in Dangriga, a U-12 (with 15 members), a U-15 (18 members) and a “senior” team (20 members) that includes players 16 years and older. Their members come from all the different denominational primary schools in Dangriga – Holy Ghost, Methodist, Anglican, Sacred Heart, and Seventh Day Adventist, as well as the different high schools. They own their own team bus, and collaborate with other coaches who are also involved with youths, such as Stephen Lourie and his Umadagu program, and Nolbert Moss, a cousin of Cliff’s, and his Wagiya program. We thanked brother Cliff Moss for his very informative visit, and wished him and his colleagues continued success with the DYFA program. As Cliff hinted, it was their original hope, which may soon be materializing, that the FFB can mirror their program in every district in Belize. From the sports desk, we also wish Cliff an enjoyable stay in the Jewel, a safe return to the U.S., and look forward to his future visits, as well as his planned re-settlement in his old hometown, Dangriga.